Biodegradable micro- and nanospheres can be produced in a continuous, contact- and contamination-free process that can be readily run under sterile conditions. Biodegradable micro- and nanospheres (MS, NS) made of poly(lactide-coglycolide) (PLGA) or other materials are very potent drug and antigen delivery systems with inherent potential for drug and antigen targeting. Present methods to produce PLGA NS are typical batch processes and suffer from difficulties of upscaling under sterile conditions. Here, we present a novel and elegant method to produce PLGA NS in a continuous, contact- and contamination-free process that can be readily run under sterile conditions. During the entire manufacturing process, the product is in direct contact only with sterile glass and Teflon® tubes. 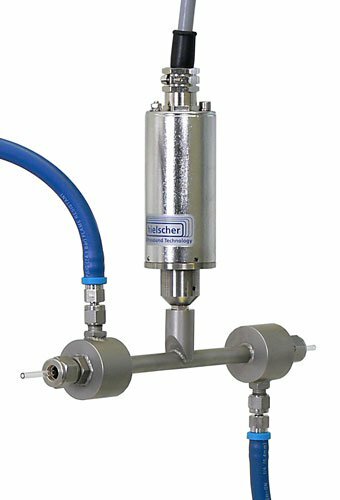 The process can be run in a closed system to prevent any environmental contamination. PLGA50:50 nanoparticles (Resomer® RG503H, Boehringer Ingelheim) were produced using a modified solvent extraction/evaporation process . 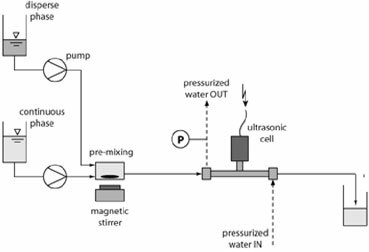 PLGA dissolved in dichloromethane (2 or 5%) was dispersed in aqueous 0.5% (w/w) PVA-solution by means of the novel experimental set-up involving a contact-free flow-through ultrasonication cell. The coarse O/W-dispersion was first premixed by a magnetic stirrer and then homogenized in the ultrasonic flow-through cell (flow rates of O- and W-phases were at 1:8). 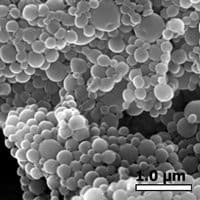 The initially formed PLGA-solvent nanodroplets gradually solidified during the passage in the tubes to become PLGA nanoparticles. Final hardening of the particles was achieved in a larger volume of 0.5% PVA solution. Nanoparticles with a mean diameter of 485 nm were readily prepared from a 2% PLGA solution in DCM at 32W sonication power (Tab. 1). The size distribution was mono-modal with a slight tailing (Fig. 3A). Nanoparticle sizes extended from 175 to 755 nm according to the 10 and 90% percentiles. Repeatability of the production process was consistently good, as reflected by only minor variability in the mean particle diameter. Lowering the emulsion’s residence time in the sonic field from 14 to 7s had only a minor impact on the nanoparticle size. A reduction of the sonication power from 32 to 25W, however, resulted in a significant increase of the mean particle size from 485 to 700nm, caused by a more pronounced tailing of the size distribution curve (Fig. 3A). A less prominent, though significant increase in the mean particle size from 485 to 600 nm was found when using a 5% instead of a 2% PLGA solution. Finally, the more hydrophilic PLGA was exchanged for the more hydrophobic and lower molecular weight PLA without noticeable changes in particle mean size and size distribution. No differences were observed in the morphology of the different batches of particles prepared from 2% polymer solutions. They all exhibited perfectly spherical shapes and smooth surfaces (Fig. 3B). The particles made from the 5% PLGA solution, however, were less spherical, showed slightly wrinkly surfaces, and fusions of two or sometimes more particles (Fig. 3C). Table 1. Mean diameter of PLGA50:50 nanospheres prepared under different conditions. Mean of two batches ± absolute deviation. Fig. 3: PLGA nanoparticles. 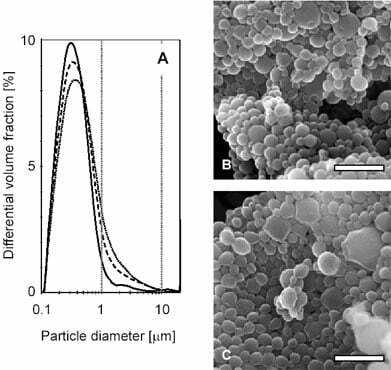 (A): Size distribution of particles prepared at polymer concentration/ sonication power of 2%/ 32W, 5%/ 32W, and 2%/ 25W%; residence time = 14 s. (B),(C): SEM pictures of particles prepared from 2 and 5% polymer solutions, respectively. 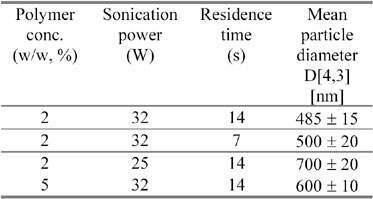 Residence time = 14s; sonication power = 32W. Bars represent 1 micron. The ultrasonic flow-through cell was found to be well suited for emulsion-solvent extraction/evaporation based production of biodegradable polymeric nanospheres. Future research will be directed towards scaling-up the process and increasing the power input to yield even finer emulsions. In addition, the suitability of the cell for the preparation of water-in-oil emulsions, e.g. for further processing into drug-loaded microspheres, will be studied. Please use the form below, if you wish to request additional information regarding this application of ultrasonics.